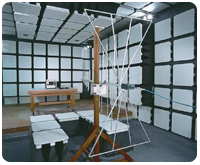 Chamber 1 is a fully anechoic, dual purpose chamber. 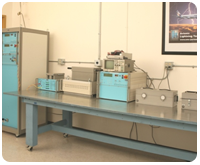 This site includes an attached isolation room for support equipment and is configured for testing to Military, Aerospace and CE immunity requirements. The chamber is equipped with an attached isolation room for UUT support equipment, a 6’ wide, double leaf door, and a 21 ft. test table, capable of supporting large system level UUTs. 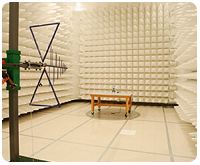 Chamber 2 is a fully anechoic chamber. This site is optimally configured for compliance testing to CE and IEC immunity requirements. Additionally, Chamber 2 yields fast and repeatable emission pre-testing results to CISPR, EN and FCC requirements. Chamber 3 is a semi-anechoic, full-scan height chamber. 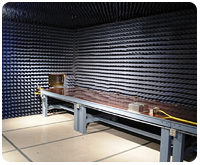 This facility is configured to perform RF emissions and transmitter performance testing for FCC, IC, ISO (automotive), CE mark, VCCI and CISPR. The zero-ambient performance of Chamber 3 makes it ideal for providing fast, accurate readings in a convenient, indoor environment. 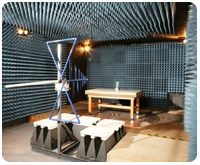 Reverberation Chamber is specially configured to perform High Intensity Radiated Field (HIRF) testing for the aerospace industry. Our 10’ x 18’ x 8’ copper lined room is equipped to reach up to 3,000 V/m (DO-160 Section 20 Cat. G), within a test volume of 4’ x 10’ x 3’. 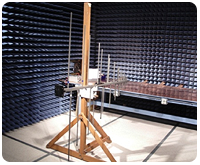 Military Chamber 1 is a semi-anechoic chamber. “MIL 1” is specially configured to meet the unique test site requirements of military and commercial aerospace EMC testing. The chamber is equipped with an attached isolation room for UUT support equipment, a 6’ wide, double leaf door, and a 21 ft. test table, capable of supporting large system level UUTs. Detailed Site Specifications. Accreditations. Get Help Now. 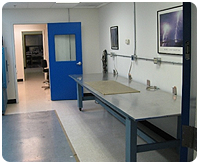 single leaf door, and a 11 ft. test table, capable of supporting up to medium sized system level UUTs. The Lightning Bench is equipped with EMC Partner lightning transient generators. The Lightning Bench performs single stroke and multi-stroke, multi-burst testing for both D0-160 and Boeing specifications. The Immunity Bench specializing in power line, signal line and contact immunity tests to EN and IEC specifications. Electrical fast transient bursts (EFTB), surge, voltage dips, variations and short interruptions (VDI), ESD and magnetic immunity are all performed on this site.